Thoughts from Mr Fenn: A week later, so let's reflect! A week later, so let's reflect! As we pulled to a halt on the hard shoulder on the M4 towards London, we could easily have become downhearted about the impending mission to Coloma Girl's School in Croydon last week. It was wet and cold, but we kept each other company and ate some sweets while playing a couple of games in the verge. An hour or so later and we were towed to the service station by three AA vans (as there were 9 of us!) where they had to get a replacement alternator before we were back on the road. Arriving at the school, we got straight into the set-up because everyone was comfortable with their roles by now. The banners were all up, and the speakers and sound desk ready for the instruments to be set up on the Sunday. Then we went our separate ways to our host homes. My host family were a very welcoming Vietnamese couple, with a daughter at the sixth form. It is an interesting experience to go into a strangers home to stay for a week, not least as most nights we get in around 7 and retire shortly after 9:30 so as to be alert the following day. It is always a great chance to talk to people in depth who are outside of the community, and to get to know how the people at the school respond to the mission. The mother was a administration worker at the school so also saw some of the presentations we did. My first visit to an all girls school. Some notable differences - year 7 and 8 are much quieter (they seem much less mature and more timid at times), good response from the sixth form from early on in the week (normally takes most of the week to build them up) and there were much more criticism of the Church as sexist than at other schools. But on the whole, the students seemed normal enough...I don't really know what else I expected. An common issue in our society was especially emphasized in a Questions and answers workshop for sixth formers. People don't know how to communicate, and more specially how to argue well. We've forgotten how to how a good religious argument. The girls would ask one question, and then as we begin to answer ask another and then suddenly ten voices are asking very specific questions and we are unable to answer any properly as constantly the topic is shifted. One of the challenges for us as the team, is to led the discussion and set the terms more in this situation. We attempt to reduce this by asking people to say their questions at the beginning and writing them down so we can link together similar questions. We need to strike a balance between effective discussion where each other can share their opinion and insights (as the students can relate to each other better this is ideal) and where we can share our understandings and what the Church has to say on the matter. But, I must stress, this is not a unique problem to that school (indeed, that very school had groups that were very good at listening and responding intelligently) even in our own community I see people struggle to listen to the counter-views to their own and will often throw back the same arguments they they heard given before even when it is not relevant to the specific topic at hand. It is very interesting to see the differences between the year groups. Year 11 (the group below sixth) asked just a few questions on sexism, gay marriage, women priests and the accuracy of the bible. But as we explained the church's view they were able to ask searching questions and come to recognize and respect the Church's opinion (even if not necessarily agreeing). You might have noticed, the theme of the questions could be tied to a misunderstanding of the doctrines of the church on sexuality; that men and women are created differently and God had a different purpose for them (simply men can't be mothers, for example) - it is false feminism to say women must be able to do all that men do as that is saying that the role of the women is less that that of the male hence devaluing women. Lightfever (adoration of the Blessed Sacrament) went very well. We ran it for just half of the lunch period, and there was over 100 students coming voluntarily on the final day. 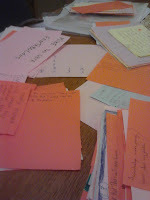 Prayer ministry time was always very busy, with many students taking up the chance (we ran out of slips each day!) to attend; this is the time that many people encounter God personally. Again, we ran out of sessions for the Sacrament of Conversion (as I like to call it, in light of debates in the house over correct terminology. The question was is it correct to refer to the Sacrament of Confession. Many people came to the conclusion that you go to confession (where you confess) to receive the sacrament of Reconciliation. I point out Catechism 1486 to claim that all are correct!). It is a great sign of hope when we have so many people seeking confession, the school promised to arrange more times for confession shortly, and a great moment sorrow to have to delay people from reception of it on that day. There was not a lack of priests, with two present most of the day, and 7 or 8 for two hours before lunch. These are signs of successful missions. Throughout the mission, things seemed to go well. Yet it felt a very human achievement at times, we did the dramas well and we answered this question well and so on, but was it a Spiritually enriching experience? We just received some feedback from students from St Paul's mission last month (see photo), and they had several saying they believe in God now, or that they really found their identity or that they will go and pray now; as well as many saying how much they love the team members! We must trust that God was at work. We try and provide the space for Him - we have prayer in each assemblies and this is varied in forms. We also went into all the classrooms on Monday and to end with we had a short time (a minute or two) in which we quieted the class and had a moments silence to allow God to speak into the hearts of the young people. We must be constantly aware that it is all for God's glory that we are working, and that we are the tools he uses for his work. p.s. It feels so much longer than a week ago!